ab23875 recognises the phosphorylated forms of AMPK alpha 1 (T172) and AMPK alpha 2 (T183). Synthetic peptide corresponding to Human AMPK alpha 1 (phospho T183). Also within AMPK alpha 2 (phospho T172). Insulin treated CHO T cells, Insulin treated 3T3L1, Metformin treated L6 myoblast cells. Metformin treated HepG2 cells (10 mM for 24 hr). ab23875 was purified from rabbit serum by sequential epitope specific chromatography. 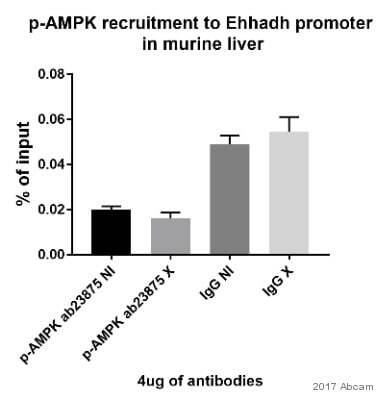 The antibody has been negatively preadsorbed using a non phosphopeptide corresponding to the site of phosphorylation to remove antibody that is reactive with non phosphorylated AMPK. The final product is generated by affinity chromatography using a AMPK derived peptide that is phosphorylated at threonine 172. Our Abpromise guarantee covers the use of ab23875 in the following tested applications. WB Use at an assay dependent concentration. Predicted molecular weight: 62 kDa. Lysates were resolved by SDS-PAGE on a 10% polyacrylamide gel and transferred to PVDF, treated or not with lambda phosphatase, blocked with a 3% BSA-TBST buffer for one hour at room temperature, incubated with relevant peptides (see below) and incubated with the AMPK alpha 1/2 [pT 172] antibody for two hours at room temperature in 3% BSA-TBST buffer. After washing, membranes were incubated with goat F(ab’)2 antirabbit IgG HRP conjugate and bands were detected using the Pierce SuperSignal™ method. 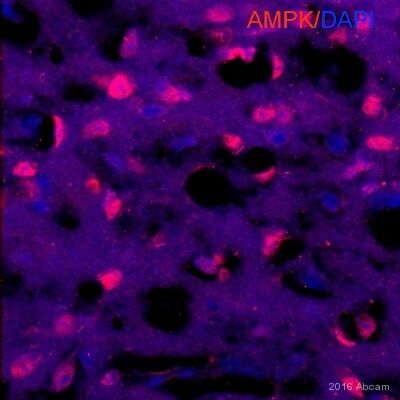 Immunohistochemistry (Formalin/PFA-fixed paraffin-embedded sections) analysis of human brain tissue sections labeling AMPK alpha 1 (phospho T183) + AMPK alpha 2 (phospho T172) with ab23875 (right) compared to a negative control without primary antibody (left). To expose target proteins, antigen retrieval was performed using 10mM sodium citrate (pH 6.0), microwaved for 8-15 min. Following antigen retrieval, tissues were blocked in 3% H2O2-methanol for 15 min at room temperature, washed with ddH2O and PBS, and then probed with AMPK alpha 1 (phospho T183) + AMPK alpha 2 (phospho T172) antibody (ab23875) diluted in 3% BSA-PBS at a dilution of 1/20 overnight at 4°C in a humidified chamber. Tissues were washed extensively in PBST and detection was performed using an HRP-conjugated secondary antibody followed by colorimetric detection using a DAB kit. Tissues were counterstained with hematoxylin and dehydrated with ethanol and xylene to prep for mounting. Immunocytochemistry/ Immunofluorescence analysis of 70% confluent log phase MDA-MB-231 cells labeling AMPK alpha 1 (phospho T183) + AMPK alpha 2 (phospho T172) with ab23875. The cells were fixed with 4% paraformaldehyde for 15 minutes, permeabilized with 0.25% Triton™ X-100 for 10 minutes, and blocked with 5% BSA for 1 hour at room temperature. The cells were labeled with Anti-AMPK alpha 1 (phospho T183) + AMPK alpha 2 (phospho T172) antibody (ab23875) at 1ug/mL in 1% BSA and incubated for 3 hours at room temperature and then labeled with Goat anti-Rabbit IgG (H+L) secondary antibody, Alexa Fluor® 488 conjugate at a dilution of 1/2000 for 45 minutes at room temperature (Panel a: green). Nuclei (Panel b: blue) were stained with mountant with DAPI. F-actin (Panel c: red) was stained with Alexa Fluor® 555 Rhodamine Phalloidin, 1/300. Panel d is a merged image showing Nuclear localization. Panel e is a no primary antibody control. The images were captured at 60X magnification. Flow Cytometry analysis of MDA-MB-231 cells labeling AMPK alpha 1 (phospho T183) + AMPK alpha 2 (phospho T172) with ab23875. Cells were fixed with 70% ethanol for 10 minutes, permeabilized with 0.25% Triton™ X-100 for 20 minutes, and blocked with 5% BSA for 30 minutes at room temperature. 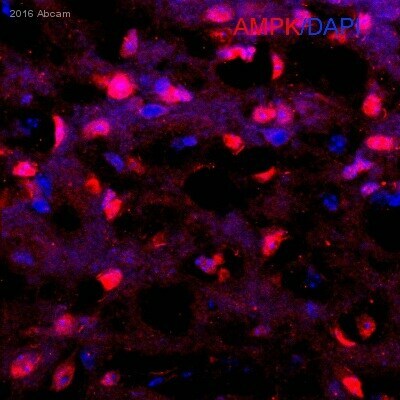 Cells were labeled with Anti-AMPK alpha 1 (phospho T183) + AMPK alpha 2 (phospho T172) antibody (ab23875, red) or with rabbit isotype control (pink) at 3-5 ug/million cells in 2.5% BSA. After incubation at room temperature for 2 hours, the cells were labeled with Alexa Fluor® 488 Goat Anti-Rabbit Secondary Antibody at a dilution of 1/400 for 30 minutes at room temperature. The representative 10,000 cells were acquired and analyzed for each sample using an Attune® Acoustic Focusing Cytometer. The purple histogram represents unstained control cells and the green histogram represents no-primary-antibody control. antibodies from the article - PMC5159533 "Chromatin recruitment of activated AMPK drives fasting response genes co-controlled by GR and PPARa"